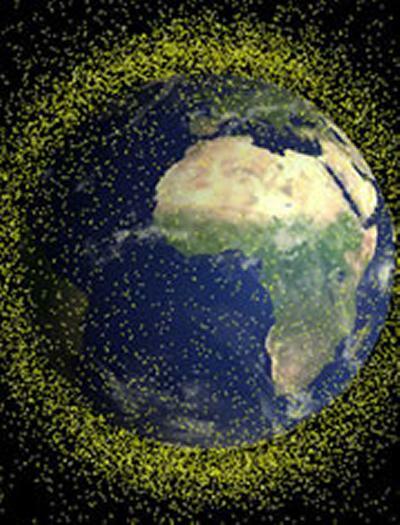 To mark World Space Week (4-10 October), the University of Southampton is launching a national competition for young scientists to design a mission to remove space junk. The Earth is surrounded by thousands of pieces of space debris, which includes satellites that no longer function, old rocket stages and even flakes of paint that have fallen off space vehicles. "Scientists are looking at ways of removing space debris," says Southampton astronautics engineer Dr Hugh Lewis. "We're inviting young people aged 11 to 18 to use their imagination and scientific knowledge to come up with their own ideas of how to clean up space junk." Researchers at Southampton, led by Dr Lewis, are investigating what problems space debris may cause in the future and what actions may be taken to tackle these problems. "As of September this year, there are more than 16,000 objects larger than a tennis ball orbiting the Earth," says Dr Lewis. "Something this size and travelling at orbital speeds of around 28,000 kilometres an hour has the same energy as several sticks of dynamite. Even a small flake of paint can damage a space shuttle. We know that if we continue to use space as we have in the past then collisions between spacecraft are more likely to happen." Scientists are monitoring space debris and using computer models to make recommendations about how to reduce the risks to future generations of spacecraft. "Ideally we would want to remove as many objects as possible using one space junk 'cleaner'," says Dr Lewis. Vice-Chancellor of the University of Southampton, Professor Don Nutbeam, adds: "Astronautics is truly inspirational, and we are keen to harness the natural inventiveness of young people in our research. We look forward to seeing the great ideas from the scientists and engineers of tomorrow. In this case, the sky is not the limit!"